Today’s news made official what had been rumored for a while now- that former Bruins prospect defender Matt Benning has signed an Entry-Level Contract with the Edmonton Oilers. Benning inked a deal with the team his dad, Brian, played for (albeit very briefly) and with the GM who drafted him in 2012- Peter Chiarelli. The younger Benning, nephew of former B’s assistant GM now Vancouver head manager Jim Benning, was a solid if unspectacular player who showed some promise as a lower-end defender with some untapped potential. Matt Benning doesn’t have much in the way of size, but like Noel Acciari, he hits hard and clean, separating opponents from the puck but not taking himself out of plays or hurting his team with undisciplined, selfish antics. Benning is a good puck distributor; not blessed with a killer shot, it was nonetheless pretty heavy, and he showed progression in his offensive game. Where Benning really established his value was with his smart, effective positional play. So, while he wasn’t a higher-end prospect who spent a lot of time at the top of Boston’s prospect depth chart for defense, he has a shot at developing into a solid role player at the NHL level given his smarts and bloodlines. Now, how & why did this happen? To put it simply- Benning took the Blake Wheeler option. The NHL’s CBA stipulates that a non-major junior player’s rights are held for four years after the team drafts him. That doesn’t include NCAA eligibility, so if a player is drafted in 2012, plays a year of junior hockey before going to school, he can either play all four years in college, which extends his team’s hold on him, or if he turns pro at anytime after that four-year mark, the team must sign him within 30 days of his formal relinquishment of any remaining college eligibility or he becomes a free agent. So, like Wheeler, Benning came out of school after three years and left NCAA time on the table, but because he spent a full year in the USHL (winning a championship with the Dubuque Fighting Saints- a team Chiarelli had part ownership in at the time and still might to this day), was able to leverage free agency to go wherever he felt was the best fit for him. It’s not about loyalty- it’s about using the tools at one’s own disposal to choose a preferred destination, which is not something every player is able to benefit from. According to veteran ProJo hockey writer Mark Divver, who had talks with a Bruins source, the B’s wanted Benning to return for his senior year and would have signed him next spring, but to the kid’s credit, he probably looked around, saw all the younger defensemen in the system, and realized that cracking the Boston roster would be a tough sell. Now, some will ask why the Bruins couldn’t just trade him for something, but this isn’t Jimmy Vesey we’re talking about here, so there’s little chance any team would offer so much as a seventh-round pick for a guy who may or may not sign there a month after he notifies the NHL that he’s leaving school (which is what Benning did), when they could just wait Boston out and make their pitch for Benning like anyone else. Given his history with Chiarelli, it isn’t all that surprising that he ended up in Edmonton, though. TSP had time for Benning- he was lost in the sauce a bit here, but was a solid player for a sixth-round pick and it wouldn’t surprise to see him establish himself in the NHL as a role guy at some point. Or not. Even with expansion looming, breaking into the top hockey circuit is a tough racket- here’s to wishing Benning the best. He leveraged his options as the CBA allows and Boston has plenty of other players to focus on. You can’t sign ’em all. Here’s to Benning finding his way out West- he’ll attract some attention at camp next month. A veteran NHL scout texted yours truly the other day to lament the fact that his team didn’t draft Charlie McAvoy when they had the chance. “We (effed) up…” is how the note began and went downhill from there. In a nutshell- his team had McAvoy in their sights and passed him up for someone else. Now, there’s a little second-guessing going on. Happens all the time, especially once the post-draft euphoria wears off and the real scrutiny begins. McAvoy is generating a lot of buzz and rightfully so- having a brilliant WJC evaluation camp will do that for you when so many NHL guys are watching. But- let’s pump the brakes here and remember that player stocks fluctuate. The 14th overall pick in last June’s draft has a mountain of expectations heading into his sophomore season at BU- he needs t build on his outstanding second half and take his play to the next level, while staying healthy. His presence at the 2017 WJC in Canada this winter will be a big test, too- the kid has broad shoulders, so the prediction here is that he’ll continue to build excitement among the fans who take the time to follow prospects much like Dougie Hamilton did after being drafted 9th overall in 2011. But as for my NHL scout friend and his team’s buyer’s remorse- that stuff happens when your pick has an “ehhh” development camp, but the message was only half serious. It was more like- Boston landed a nice player at 14 than anything else. We can sit around and get excited about analysis and discussion, but the real rubber will meet the road in the coming season when McAvoy gets a chance to prove himself. Being told by a solid (non-Bruins) source that he believes that Boston is quietly working on a trade for a defenseman, but no details are forthcoming. If you haven’t already, you can read my post about the Boston D- the elephant in the room for thoughts on possible targets. Wouldn’t be surprised to see them bring in another veteran forward as well. Some will question that, and it’s the nature of the beast- especially since it could block a younger (yet unproven) player from a roster spot in October, but teams hedge their bets and look to build depth (to stave off the injury bug) and foster training camp competition. Watch for the B’s to extend a training camp invite to an experienced, and as-of-yet signed player. Can’t tell you who that might be, but some name-recognition guys still out there (who might appeal to Boston- by no means a comprehensive list and in no particular order) are: Tomas Fleischmann, Mike Santorelli, Shawn Horcoff, Alex Tanguay, David Jones, Tyler Kennedy, Patrik Elias (he’s already 40 but hard to imagine him playing for anyone else after spending all of his 1,240 NHL games and 1,025 points with the Devils), Dainius Zubrus, Mike Richards. Did I really type that name? Well, he is only 31, but yeah- slim pickings for sure. I know, I know- there are some of you who will look at that list and immediately want to comment that none of them are needed. I get it- save yourself the trouble by not shooting the messenger, please- I’m just passing on what I’m being told. If we see another veteran forward brought in, don’t say you weren’t warned, and we’ll analyze who that someone is if/when it happens. 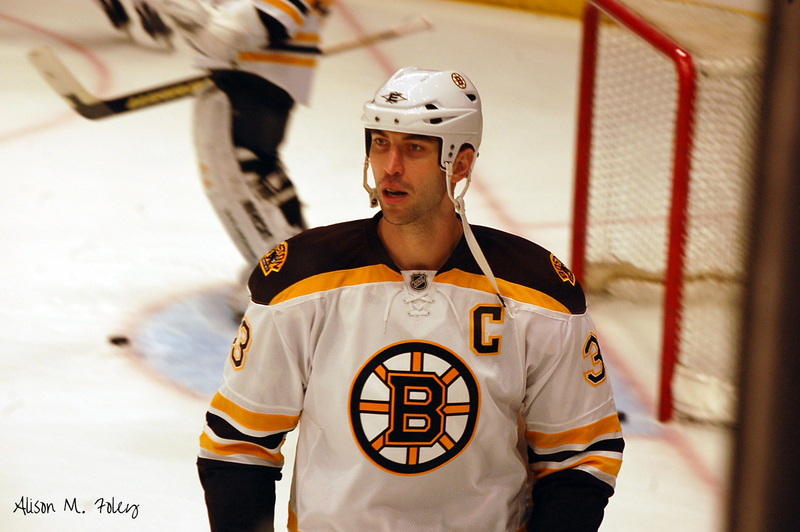 What Bruins player are you most intrigued with entering the season? 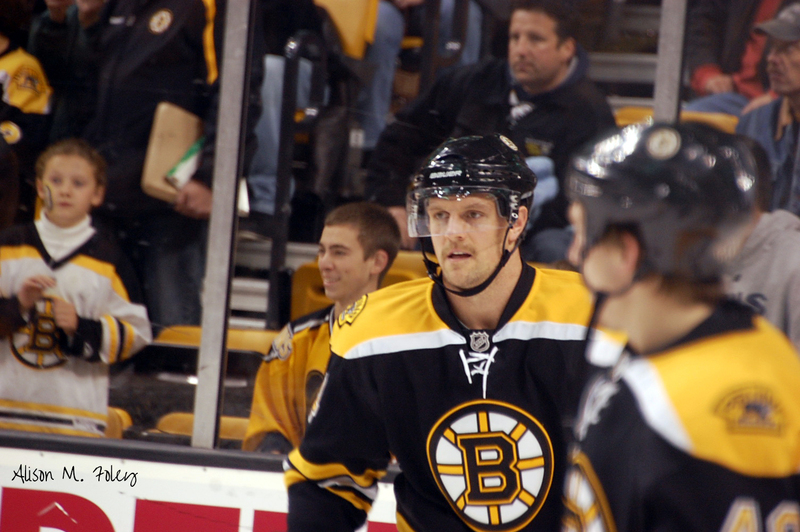 For me, it’s rookie Danton Heinen, who was a surprise fourth-round pick out of the BCHL in 2014, but went on to post two very good offensive seasons at Denver University before signing with Boston last April. He’s a winger, but played center in junior, so he’s played all three forwards in the last three seasons going back to 2013-14. The Bruins and coach Claude Julien do love their versatile guys, don’t they? But what stands out about Heinen is his smarts and offensive creativity. He’s not this explosive, dynamic presence who grabs the spotlight and demands your attention when he’s on the ice, but when you watch him closely, he’s always around the puck and tends to own the walls when a possession battle is up for grabs. Heinen has a deft passing touch and he’s no slouch with the puck on his stick when it’s time to pull the trigger, either. Watch for him to make the big club out of camp, and he wouldn’t be a bad option to try out on that third line right out of the hopper. We’re back with part 2 of the mid-summer look at where the prospects in the Boston Bruins organization stack up. As previously mentioned in part 1 when we reviewed 23 of the prospects who will play in the pro hockey ranks this coming season, this is a subjective list based on multiple inputs to include (but not limited to) live viewings and film study, input from members of the Bruins organization and some sources around the NHL not with Boston, media and fan observers who attended the recent development camp in Wilmington from July 12-15. This is just one view and take- there will no doubt be disagreement, but I would offer that even if the Bruins as an organization released their own rankings of where they think their prospects stack up from 1 to 40-something, folks would still take issue with it. We would live in a mighty boring world if everything was definitive and we agreed on everything. So, with that in mind, here is the supplemental podcast (complete with Dirty Harry theme music from the early 1970’s) and the write-ups on the kids expected to spend the season in the amateur ranks for 2016-17. Charlie McAvoy, RD Plus: The 14th overall pick has the skating and sense to become a legitimate two-way presence on the blue line in the NHL one day; watch for him to take a significant step forward in his development during his sophomore season at Boston University. Minus: He’s only about 6-foot tall; lacks the kind of ideal NHL height for the position, and needs to keep honing his judgment and decisions as an aggressive offensive player who can at times get too far up the ice. Zach Senyshyn, RW Plus: A year after tallying 26 goals on the bottom line and without much special teams time, the 15th selection in 2015 scored 45 goals to lead the Soo Greyhounds; he’s a big, explosive and skilled scoring presence on the right side. Minus: The goals are great, but the 19-year-old has work to do in his 200-foot game; he has a tendency to wait for the next scoring chance or let others go and get him the puck. Jakob Forsbacka-Karlsson, RC Plus: When it comes to maturity, poise and a complete game at the center position, no prospect brings more promise than the BU sophomore; he’s already earned an ‘A’ on his sweater, and has drawn positive comparisons to Patrice Bergeron for his pure intelligence and playing style. Minus: The Stockholm native and 45th overall pick from 2015 does’t seem to have the kind of exciting and dynamic offensive upside of others in his draft class, but he’s one of those players who will likely play 10-15 years as a key cog because he can do a little bit of everything. Jeremy Lauzon, LD Plus: Underrated no more after a 50-point season (he only played in 46 games due to WJC camp and injuries); 2015 second-rounder has skill, smarts and some jam/toughness as a two-way D prospect who keeps getting better. Minus: He gets lost in the sauce a bit with all of the competition for blue line jobs in Boston; had a tough time staying healthy with a variety of injuries including a serious skate cut to the neck that could have severed a nerve and ended his career. Ryan Donato, LC (Scituate, Mass.) Plus: Coming into his own after a strong freshman season at Harvard; was one of Boston’s real standouts at the development camp, showcasing his high-end hockey sense and hands throughout. Minus: Still several years away from competing for an NHL job; needs to keep developing the physical aspect of his game and must continuing moving forward in his three-zone progress. Jake DeBrusk, LW Plus: High-end hands plus very good hockey IQ/offensive creativity make DeBrusk a legitimate scoring threat every time he has the puck on his stick; good attitude and drive- overcame a debilitating lower body injury early in the season to finish strong in the WHL playoffs and Memorial Cup tournament. Minus: His size and strength are pretty average and he might be ‘tweener right now in terms of not quite being ready physically for the pro hockey grind- could return to the WHL for his overage season. Jakub Zboril, LD Plus: Came to camp leaner and in better shape with more jump and energy than was reported a year ago; when on his game has all the tools in the toolbox to be a No. 2 or 3 two-way NHL D with some bite and nastiness on the physical side. Minus: At times loses his focus and appears disinterested; the positive strides last week are encouraging, but Zboril still has to prove that he can maintain his intensity and consistency over a longer period of time. He has impressive big league potential if he can put it all together. Jesse Gabrielle, LW Plus: Surprise (maybe not to him and his supporters) 40-goal scorer after being picked in the fourth round a year ago plays the kind of scoring game with an edge that Boston fans love; has worked himself into excellent shape and added strength and mass since being drafted. Minus: Will have to guard against a letdown season now that WHL opponents will be keying on him this year; as a ’97-born player he has to make the Boston roster out of camp or go back for a full season with Prince George- he can’t play in the AHL on a full-time basis yet. Ryan Lindgren, LD Plus: All-around skilled and hard-nosed defender is a proven leader and player; Minnesota product has no flaws in his game and could be the captain-in-waiting of the University of Minnesota Golden Gophers if he spends enough years there. Minus: He’s only about 6-feet in height, so given his physical nature, he will face some limitations in certain matchups and could pay the price physically; there isn’t a ton of dynamic upside here. Ryan Fitzgerald, LC (North Reading, Mass.) Plus: Feisty, gritty center erupted offensively as a junior with his finest season for BC- will contend for the 2017 Hobey Baker Award. He’s got terrific hockey sense and a nonstop motor that inspires teammates and infuriates opponents. Minus: The size and skating concerns have followed him since before the long-time Massachusetts minor hockey standout was drafted at the end of the fourth round three years ago. Might need to move to wing to thrive as a pro. Anders Bjork, RW Plus: One of the top performers last week at development camp with his speed and energy, it all comes after he surprisingly let the Fighting Irish in scoring as a sophomore last season. Minus: Bjork is an interesting player to watch- he was a late fifth-round pick in 2014 and could be one who tries to leverage path to free agency if the Bruins are unable to sign him this year. Trent Frederic, LC Plus: The polarizing pick in the 2016 draft’s first round has settled concerns down some with his fine size, athletic ability and willingness to roll up the sleeves and get to work. He’s a strong two-way player and solid citizen who might just be scratching the surface in terms of his offensive game and potential. Minus: There’s not a lot to get excited about here- Frederic has impressive physical tools but is raw and might not ever be much more than a bottom-six forward assuming he reaches the top rung of the pro hockey ladder. Wiley Sherman, LD (Greenwich, Conn.) Plus: Huge (6-7) defender is such a fluid, impressive skater for one so big and that’s always been his calling card going back to his days at the Hotchkiss School. Minus: Scouts are divided on his long-term potential: the physical tools are on another level, but can Sherman react and process the game effectively enough to thrive in the NHL? Cameron Hughes, LC Plus: Highly skilled, creative playmaker was a late-round pick out of the Wisconsin Badgers and showed solid progression in his sophomore season with 25 points in 32 games- watch for his production to go up with new coaches who will lean on him. Minus: He’s a smallish player trapped in a light 6-foot frame that isn’t going to get all that bigger based on the body type; while talented, he can be neutralized by teams with size and mobility on the blue line. Matt Benning, RD Plus: Smart, opportunistic defender who plays bigger than his 6-foot frame and has been a standout at Northeastern over the past three seasons. Minus: Benning was not asked to attend development camp, and according to the ProJo’s Mark Divver, that could be a harbinger to his imminent departure from the organization either via trade or by pursuing similar action by Kevin Hayes, Mike Reilly and Jimmy Vesey to play out the NCAA string in 2017 and become an unrestricted free agent next summer. Cam Clarke, RD Plus: Smooth-skating intelligent rearguard can move the puck and excels with extra time and space as a PP QB; he’ll get a chance at premium playing time right off the bat at Ferris State. Minus: He’s still quite raw and observers pointed to times during the development camp when he was a little behind compared to other players. Clarke was drafted in the fifth round as a known project, and the payoff will take time if at all. Joona Koppanen, LC Plus: Big (6-5) center has the skating and smarts to make the NHL one day in more of a defensive, shutdown role; he’s seriously considering the NCAA path, which would be a good step for him. Minus: There’s just not a whole lot there in terms of hands, offensive skill and long-term potential beyond being a serviceable bottom-liner and journeyman. Jack Becker, RC Plus: 6-foot-3 power center as some impressive finishing skills, especially in close when time and space are lacking; shows some intriguing offensive potential in flashes after a solid but unspectacular USHL season in Sioux Falls. He scored a memorable breakaway goal in the camp-ending scrimmage. Minus: University of Wisconsin-bound 2015 7th-rounder was once described as “thorny” by a scout in that he’s got a lot of developing ahead, and like Clarke- was said to struggle at times in camp last week with the pace and demands of the drills. As a companion post to what I put up yesterday in going back to look at the Boston Bruins’ roster players and how they were projected in the annual Red Line Report June draft guide issues going back to 1999 (Chris Kelly) through 2014 (David Pastrnak), I thought we could also take a quick peek at the team’s prospects…the good, the bad & the ugly and see what is perhaps in store. My conclusions from yesterday’s exercise- not enough production from the Bruins with their draft picks. Their best players (not including Zdeno Chara-I didn’t have a RLR 1996 draft year ranking for him, or guys like Tuukka Rask who were drafted by other teams) were all beyond the top-50 as ranked by Red Line, which goes to show you that hitting on first-rounders isn’t the be-all, end-all of developing players. However, there is clearly a dearth of high-end talent: All three of Phil Kessel (2), Tyler Seguin (2) and Dougie Hamilton (5) are gone. Boston had a chance to move up to grab Noah Hanifin (3- 2015) but it didn’t pan out, so they went with three picks in the middle of the round instead. This gets to the heart of some of the concerns and criticisms fans and observers have voiced in recent years. It’s legitimate, but the B’s have also netted some value selections along the way as well. So, let’s get onto the prospects, shall we? This post will cover most prospects/players still in the system (and in at least one case- on the way out) from 2010-12. Observations: RLR nailed the pre-draft projection, and it is true- McIntyre (who changed his last name in 2014) had some technique issues coming out of Minnesota HS. He had a setback last season, as he struggled to adjust to the tempo and skill level in the AHL, but here’s betting that the soon-to-be 24-year-old will bounce back. The 2015 Mike Richter Award winner as the NCAA’s best goaltender has plus character and hockey smarts, but probably needs to settle down and simplify his approach. The shine is off his star a bit compared to where it was a year ago (and it had to hurt watching North Dakota win the 2016 collegiate title without him), but don’t count him out. McIntyre has shown a penchant for mental toughness, and he’s motivated to prove his worth. Watch for something from him this offseason here on the blog. Observations: ‘Koko’ slipped to the second round amidst concerns about his average size and relative skating for his diminutive stature, though for several years, he looked to be near the top of Boston’s prospects depth chart. On the plus side, he’s got high-end creativity and to his credit, evolved his game in Providence, going from a bumpy start in 2013 to becoming (now Boston assistant) Bruce Cassidy’s go-to guy up front with two consecutive productive AHL years. Unfortunately, in albeit limited chances in Boston, Koko could never get it going to stick. The debates are endless over whether he was given a real opportunity, but at some point- you have to look past the coaches and focus on the player. For whatever reason, he made barely ripple despite ample preseason ice time and team sources told TSP that Koko did not respond very well to what the coaches wanted him to do. His goose is essentially cooked in Boston, as he has reportedly signed with St. Petersburg SKA of the KHL and will return home to Russia unless the B’s can figure out a way to deal him elsewhere for anything they can get. It’s an unfortunate story for Boston, but the reality is- there is plenty of blame to go around for his inability to make it work here. Observations: As a previously passed-up player in 2010, RLR wasn’t keen on Ferlin despite his highly productive 2010-11 campaign with the Indiana Ice. Despite an awkward-looking skating stride, the Jacksonville native did some impressive work at Cornell in three seasons before turning pro in 2014. He made gradual but steady progress in the AHL as a rookie in 2014-15, earning a late-season recall to Boston, where he played a solid, grinding game on the B’s fourth line. Unfortunately for Ferlin, he suffered a concussion in the 2014 AHL playoffs, and one game into this past season, took another high hit that aggravated that injury, costing him much of his second pro campaign. His challenge is to work himself back into the mix with so many other similar bottom-six forwards in the system. Observations: Acquired from San Jose as part of the return for Martin Jones, the Ohio native joins Austin Czarnik as consecutive Miami Redhawks captains in the B’s system. Red Line was not all that keen on Kuraly in his draft year, ranking him significantly lower than where he ended up going. With a big frame and decent skating in a straight line, he isn’t naturally skilled or all that creative offensively. He looks and acts the part of a solid grinder who will likely transition to the wing at the pro level. A solid middle tier player, don’t expect any kind of extraordinary return on investment, and he’ll likely spend at least one full season in Providence, maybe two before he’s ready to seriously challenge for a full-time NHL position. Observations: This Red Line favorite went way beyond where that service projected him, but so far- the Yale grad has lived up to the promise he showed as a Milton Academy junior. A big and mobile shutdown defender, his offensive numbers dropped off in his senior season after a surprising junior year. He’s always been a fine skater with agility and fluid footwork even when a gangly teen, so now that he’s filled out to a solid 6-4, 225 pounds- he has the physical attributes to make a run at the pro level. The Long Island native looked real good in late-season work with Providence in the spring, scoring his first pro goal and demonstrating that he belongs. Watch for him to begin the year in the AHL, but it’s not outside the realm of possibility that he could make the big club with a strong camp and preseason or earn a call up at some point during the season. There isn’t a high offensive ceiling, but with his smarts and skating, O’Gara could stabilize the middle pairing one day. Observations: RLR was ahead of the curve on Czarnik in 2011, when he was ranked in the top-150, but despite being a talented scorer out of Green Bay of the USHL and later Miami University, no one took a flyer on him. Boston surprisingly won the free agent sweeps after he completed his senior season a year ago, and he immediately formed chemistry with fellow free agent Frank Vatrano in Providence and again in their first pro training camp together last September. Although just 5-7, Czarnik has blazing wheels, superior vision and a gritty, energetic game. All he needs is an NHL chance, and he doesn’t appear to be too far away from getting one. Observations: Though not ranked by RLR in the 2011 draft guide, the service was onto him, listing him in the January issue as a player who played a very heavy and physical, but clean game. 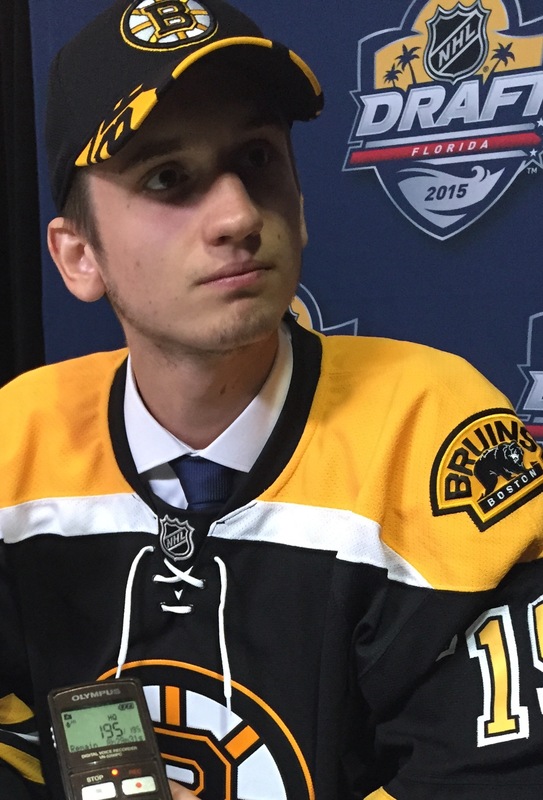 Four years later, Acciari parlayed that into the captaincy at Providence College and a national championship before signing with his childhood favorite Bruins. Undaunted by the prospect of being an undrafted free agent in a sea of like players, Acciari played hard for Providence and if not for taking a slap shot to the face that broke his jaw, would have made his NHL debut even sooner than he did. Acciari played 19 big league games (1 assist) but impressed with his adept faceoff skills, ability to hit hard but clean (ask Brooks Orpik about that) and ruggedness and mature character as a rookie. He did a fine job as Boston’s fourth line center, and he’ll never be one to put up much in the way of points at the NHL level, but more production would be welcome. Observations: Ranked later in the 2011 draft guide, Griffith was even more impressive the following year, and like Jimmy Vesey, parlayed a superb 18-19-year-old season into a draft ticket in Pittsburgh after being snubbed. Griffith has a smallish frame and is not a dynamic skater, but boy- can he ever score! He finished near the top of the AHL in scoring last season and has an uncanny creativity and knack for generating offense. The biggest issue holding him back is the fact that he might be a classic ‘tweener: a highly effective AHL performer, but simply not fast or strong enough to be a top-six winger in the NHL, while lacking the ideal tools to be an effective bottom-six forward. He’s a heck of a talent, but might not be the right kind of fit to thrive in Boston. The key question is if that is in fact the case- can Don Sweeney leverage him into a helpful return, or will he be lost to another club for little to nothing? Observations: The RLR staff were not fans, as evidenced by Subban’s third-round projection. Boston surprised by grabbing him in the top-25, which was an eyebrow-raiser at the time, mainly because the Bruins didn’t need a goalie and you could make a convincing case that he wasn’t the best player on the board. In fairness to Boston, the talent level in 2012 dropped off a steep cliff in the first around 20, so Subban wasn’t a terrible gamble to make, but he’s struggled to establish himself as the team’s future option in net. Last season, he suffered a lower body injury and then was pretty rotten in his first month of play as he worked through some movement issues. However, in early December through the end of January, it was as if someone flipped a switch- he played the best hockey of his pro career to date. Then, during warmups against Portland, he took a shot to the throat, fractured his larynx, and was lost for the rest of the season. That’s simply how things have gone for Subban, but he might just get the opportunity to be Rask’s backup this season. The talent is there- even if the luck and playing experience hasn’t been. RLR’s low draft ranking reflected questions about his technique and overall long-term potential…he has yet to prove them wrong for the skepticism. Observations: This Charlestown native is another lower-ranked player that the B’s took much earlier, though in the Boston University captain’s case, he looks a lot better than where he was projected. 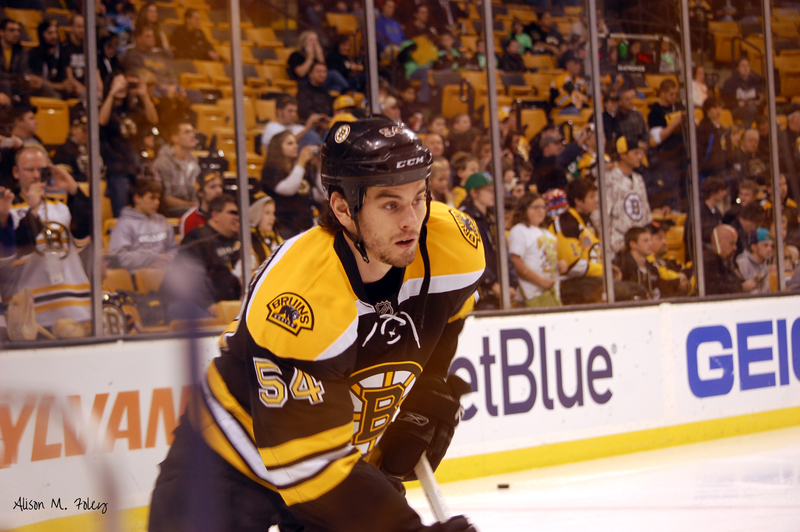 A standout at Belmont Hill Academy before leaving Massachusetts for the National Team Development Program in 2010, the small but speedy and smart offensive blue liner was not a big riser at the draft, and Grzelcyk originally didn’t even plan to go to Pittsburgh to attend in person until he caught wind that it would be well worth his time. After the Bruins selected Subban in the opening round, they didn’t have a pick again until the late third round, and that’s where they grabbed him. He’s had his injury challenges- losing significant time to shoulder and knee surgeries, but with his wheels and natural offensive instincts, he could contribute at the NHL level one day after an AHL apprenticeship first. Observations: At the time, there were whispers of nepotism when the B’s drafted assistant GM Jim Benning’s nephew out of Spruce Grove of the AJHL, but to his credit, the younger Benning is legit and has worked his way into becoming one of Boston’s most underrated prospects. Although he has just average height, Benning is a punishing hitter who moves around the ice initiating contact. He’s got the vision and a soft touch on the puck to be effective in the transition game, and he also showed some improved power on his point shot this season for the Huskies. He’s not a flashy or dynamic offensive presence, but he chips in with key production, as he did in helping the Dubuque Fighting Saints to the USHL’s 2013 league championship. Banning is positionally savvy with a willingness to do the dirty work and like his dad, Brian, might be one of those players who goes on to fashion a solid if unspectacular NHL career because of his versatility and smarts. Observations: The rugged, older Texas power forward was picked up late and had very low expectations headed to Western Michigan University, but he has improved his offense in each season since the B’s grabbed him in the final round. With his big frame and natural strength, Hargrove showed some unexpected offense this season, doing some grunt work out in front of the opposition net and getting rewarded for it. Sweeney said that Hargrove put in diligent work last summer to improve his conditioning for the AHL and it paid off for him. He’s still a work in progress and will likely top out as a grinding third-line wing (at best) if he makes it to the NHL, but has the makings of a capable power forward and depth player for Boston. He needs to take the next step in 2016-17 and not regress after the pleasant surprise that was his rookie pro campaign. Observations: What a story- from the outhouse to the penthouse! Very few were on Vatrano in 2012 not because he didn’t have talent, but because he was overweight and didn’t show the requisite work ethic to give teams confidence in taking a draft flyer on him. Those clubs are all regretting that now, as he not only was a goal-per-game guy as a rookie AHLer (36) but even impressed in stints with the big club. Vatrano rededicated himself in the offseason and came to rookie camp in September about 20 pounds lighter, looking like a completely different player. He always had that laser wrister that struck fear into opposing goalies, but he didn’t always move his feet and without the right conditioning, took longer to recover in between shifts. Now, he plays with manic energy and uses his quickness to dart into skating lanes and get himself into scoring position. He was like a mini-Midas last season- practically everything the East Longmeadow native- we like to call him the Springfield Rifle- touched…turned to gold. He’ll have a lot of scrutiny on him in the new season- he won’t sneak up on people like he did this year, but some guys just have “it” when the puck is on their stick, and Vatrano is one. When you hit on an undrafted free agent like the Bruins did with him after just one full year at UMass, then it takes the pressure off of the lack of success the team has had at the draft. Coming soon: Bruins prospects in their draft years, 2013-15. The 2015-16 hockey season came to an end in the first round of games at the NCAA D1 championship tournament Friday for a trio of Bruins prospects, plus a fourth who was injured and didn’t suit up for Harvard’s 4-1 loss to Boston College. Northeastern University had a killer draw, facing the University of North Dakota Fighting Hawks, who didn’t win the NCHC (St. Cloud State captured that honor), but were at or near the top of the NCAA poll all season. The Huskies took the early lead but UND scored five unanswered goals in what was an eventual 6-2 victory for the Hawks. B’s prospect Matt Benning scored NU’s final goal of the season, his sixth tally overall. Anders Bjork was the University of Notre Dame Fighting Irish’s top scorer yesterday, ripping a laser beam past University of Michigan goalie Steve Racine to tie the game at 1 in the first. He then assisted on Thomas DiPauli’s second period goal with a highlight reel move through three Wolverines players to gain the offensive zone, then one-hand a drop pass to the goal scorer. Unfortunately for Bjork and his mates, the game went to overtime and the famed ‘CCM line’ of J.T. Compher, Kyle Connor and Tyler Motte ended Notre Dame’s season with Motte’s sudden death strike. The Harvard Crimson played hard, but a tough start and 0-3 hole was too tough to overcome against the BC Eagles. Ryan Donato showed some impressive flashes of what could be to come for the talented pivot, but was held off the score sheet. His linemate, Seb Lloyd, tallied Harvard’s only goal. On the other side of things, Ryan Fitzgerald was on the winning club, and assisted on Alex Tuch’s somewhat controversial goal to give the Eagles a 1-0 lead. Tuch appeared to drive Harvard goalie Merrick Madsen into the net before the puck ended up over the goal line, but after a lengthy delay on two reviews, the goal call was upheld. Providence College’s double-overtime loss not only means that the Friars’ defense of their 2015 NCAA championship title is finished, but also began the Brandon Tanev free agent watch, and the Bruins along with another usual suspect in the NHL are rumored to be in on the speedy forward from Toronto. Season in review: One year after scoring nary a goal in a 24-assist sophomore season, the former Spruce Grove Saint (AJHL) and Dubuque Fighting Saint (USHL) found the net six times and finished with 19 points from the blue line, good for second place on the Huskies among defensemen (Garrett Cockerill-22 points). Benning played a career-high 41 games as a junior. He was as solid and dependable a defensive presence as they come; Benning is not a big point getter, but he played a lot of minutes at even strength and special teams for NU coaches Jim Madigan and Jerry Keefe as one of the Huskies’ alternate captains. Outlook: In a more recent update, TSP (this blog for those who might be wondering) talked about Benning being one of the more underrated prospects in the Boston organization. He’s not flashy or dynamic- he skates well and uses his natural hockey savvy to be in the right place to make plays in his own end. He’s not big by NHL standards, but like a defense version of Noel Acciari hits hard and clean. The son of former NHL rearguard Brian Benning isn’t an in-your-face intimidator, but he’ll step into players in the open ice with his ability to come across the grain smoothly with effective lateral glide and footwork. He’s just a smart player who motors along while other more hyped players get the lion’s share of the attention, but his goal yesterday was a statement and reminder that after being an unheralded sixth-round pick in 2012, he’s still progressing and growing. Don’t sleep on Benning as a solid eventual middle tier contributor in the NHL who just might have the same kind of stealthy upside his dad brought as a legit No. 2-3 two-way defender in his prime. Season in review: One word for Bjork’s sophomore campaign in South Bend: impressive! The 2014 fifth-rounder doesn’t have much in the way of size with a 6-foot frame that isn’t going to put on a lot of mass beyond his already 187 pounds. However, he used it to max advantage this year, leading the Fighting Irish in scoring despite being the third-youngest player on the roster behind fellow 1996-born skaters Dennis Gilbert (October vs. August) and Dylan Malmqvist (another Aug. ’96 who is younger by just a couple of weeks). Bjork consistently found his way on the scoring ledger all year and demonstrated an impressive ability to set the play from the off-wing. He plays a heavy game despite not having an abundance of size and against Michigan in the NCAA tourney he was dangerous and pushing the pace well until it appeared he took an awkward spill that might have affected him. He was not as effective the rest of the way, but still was a noticeable presence as Notre Dame put a scare into the Wolverines. Outlook: As a sophomore, the Bruins will likely leave Bjork in school for at least one more season, maybe two. He’s not what you would consider an elite scoring forward but there are no flaws in his game. The Wisconsin native is smart, hard-working and opportunistic. He’s shown a penchant for scoring the highlight reel variety of goal, particularly in the USA bronze medal-clinching game last winter at the World Jr. Championship. While I’m not one to throw the words “draft steal” around all the time, Bjork looks like superb value at 146th overall. He’s got the speed, smarts and tough mental makeup of a higher-end third-liner if he continues to develop and progress. The Bruins are thrilled with what Bjork has done since they drafted him. Season in review: Don’t be alarmed at the statistical differentials, as the biggest disparity comes from Donato’s senior prep season- he scored 53 points in 31 high school games. His NCAA freshman season production compares more favorably to his stints in the USPHL with South Shore and USHL at Omaha. As a center playing for his father, Donato showed promise and validated his standing as a late second-round draft pick in 2014. He took a backseat to Jimmy Vesey, Alexander Kerfoot and Kyle Criscuolo when it came to scoring, but he flashed his impressive offensive talent throughout his first ECAC season. Last night, he made one memorable play in the first period when he came out of the corner and took the puck to the net, evading one BC defender before cutting back against the grain and nearly tucked a shot inside the left post. He was denied by Thatcher Demko, who made a great athletic play, but that kind of display of stick handling and hockey sense is a reminder of why Donato was such a dominant prep forward at Dexter School. Donato also looked good with Team USA at the World Jr. Championship, scoring a pair of goals in the bronze medal game but also showing a willingness to bear down and play a more limited/checking role for the American squad. Outlook: Steady as she goes for Donato, who has the hockey bloodlines and passion to be a real good one in time. The Bruins aren’t in any immediate need to have him develop on a rapid timeline, so they can afford to be patient and take their time- expect him to play at least two more seasons in Cambridge, possibly three. However, he’s got to get stronger and keep improving his three-zone game. Watch for the production to jump as he will soon be one of Harvard’s most skilled forwards with the departure of Vesey and other upperclassmen. Season in review: A solid sophomore year ended in disappointment with Sherman injured and out of the last couple of games. He finished second in scoring on the Crimson blue line with 10 points, scoring his first goal after going without hitting twine in 37 games as a freshman. With his mobility and reach, he showed improved play in his defensive end and his confidence is growing. Not having him against BC made a tough slog that much more difficult for Harvard, so it will be interesting to see how he performs in his next couple of seasons and if he can become a dominant shutdown presence in the ECAC. Outlook: The 2013 fifth-rounder out of the Hotchkiss Bearcats is 6-foot-6 and skates fluidly for a guy so tall. He’s still lanky and has a lot of filling out to do. He’s more of a gentle giant than a tough, intimidating baggage-masher, however. When afforded time and space, Sherman moves the puck quickly and effectively. However, when the game speeds up and closes in on him, he can be forced into turnovers and questionable decisions. Extremely raw when the Bruins drafted him, even then-GM Peter Chiarelli said that Sherman was going to be a project player. He’s coming along well, but it’s far too early to project him with a crowded organization of middle-to-lower tier defense types. It will be another two years before the B’s are forced to make a decision on him, so watch for them to take the maximum time and assess how he performs as an upperclassman when he’s given a larger role as the anchor of the Crimson blue line corps. Born on on the last day of 1991, the 24-year-old undrafted free agent out just finished his fourth and final NCAA season at Providence College. The brother of Vancouver Canucks D-man Chris Tanev has blazing wheels and can put defenders on their heels with his pure open ice speed. More of a defensive/energy forward than a high-upside scoring winger (Tanev can play either side), he’s one of the better free agent options this spring, but should not be expected as an immediate impact guy in the NHL. The Bruins brought Tanev to their development camp last summer, but that is no guarantee in itself that they can successfully convince him to sign with them. The familiarity no doubt helps, and the B’s have done a good job of keeping tabs on him and making their faith in him known. Whether it is enough to convince him to come to Boston or he opts for a team that can provide him a better opportunity to come in and play sooner/with less potential competition could be the deciding factor. Of course, if he’s looking at Frank Vatrano, PC pal Noel Acciari and even how well Austin Czarnik has done this season in the AHL, Tanev is already well aware of the opportunity that exists in Boston. There’s also this- a solid source mentioned today that the Chicago Blackhawks like Tanev as well. It’s amazing what a winning organization can accomplish- the ‘Hawks know they can unload draft picks every spring, but when they can attract the better free agent options, losing picks in favor or more developed and mature players on a faster timeline to the NHL is the way a top team stays in the elite. We saw it with Artemi Panarin a year ago, and while Tanev might not presently project as a top-six NHL forward, with his speed and smarts, he’s one of those guys you win with. If Chicago wins the bidding for him, then it’s one more shot across the bow to the rest of the league that at times to be playing checkers while Stan Bowman is playing chess. Of course, Boston and Chicago are just two teams after Tanev…there are others. You can bet on it. We shall see where Tanev ends up, but as of now, the B’s are in on him, so we’ll just have to see where it all leads. As tweeted out over the weekend, several reliable sources told me that Denver University sophomore forward Danton Heinen will turn pro after he plays his last game for the Pioneers. What remains to be seen is how soon the Boston Bruins will sign their fourth-round selection from the 2014 NHL Entry Draft. With the team at 47 contracts and allowed a max of 50, the B’s have some decisions to make on timing of signings, as in addition to Heinen, there are three other NCAA seniors that will need NHL deals before August 1: Matt Grzelcyk, Rob O’Gara and Sean Kuraly, who was acquired from San Jose last June along with the Sharks’ first-round selection for goaltender Martin Jones. With respect to Heinen, he has NCAA eligibility remaining, and the other guys don’t, so that’s a total of four contracts assuming the B’s sign all of them. Last weekend, the RedHawks and captain Kuraly saw their NCAA tournament hopes dashed by the University of Minnesota-Duluth, who knocked them out of the NCHC playoffs. That makes Kuraly eligible to sign now and go to Providence on an ATO to finish out the season in the AHL if the Bruins so choose. Whether they will do so is going to come down to an internal organizational decision, as the 23-year-old center is less of a scoring/top-six type of forward and more of a bottom-six/grind-it-out checking player who plays a heavy game but doesn’t bring much in the way of a high offensive ceiling for the NHL. Kuraly is coming off of a disappointing statistical season- one that saw him crash from a career-best 19 goals as a junior to just six tallies in 36 games with head coach Enrico Blasi’s Redhawks. He’s a good skater for his 6-foot-2, 210-pound frame and has a hard, heavy shot. The Ohio native is not all that creative nor does he bring much of a high-end skillset with the puck. He’s a good faceoff man and penalty killer, so there’s promise here- not everyone can progress on to the NHL and once there, then slot into a prime scoring role. In Kuraly’s case, he’s always been one of those players whose game and versatility translated more as a checking forward at the highest level and there’s nothing wrong with that. One member of the Bruins organization told me hours after the trade bringing Kuraly to Boston went public that they were hoping he would one day be a third-liner for them, so even at the most optimistic period- coming off a career year in Oxford- the B’s didn’t have many illusions about what type of player he was going to project as for them. That brings us back to Heinen. To say his upside is considerably bigger than that of Kuraly is an understatement. After a tough team start offensively (DU was just 7-7-4 and 3-4-1 in the NCHC back in late December- the Pios finished with a 17-5-2 conference record, going 14-1-1 after the halfway point) Heinen and the Pacific Rim line went into overdrive when the calendar turned over to 2016 and he’s been absolute dynamite since February. The versatile winger who played LW for Jim Montgomery as a freshman after being a center in junior hockey, has been over on the right side this season with Trevor Moore on the left and Dylan Gambrell in the middle. Denver just knocked University of Nebraska-Omaha out of the postseason, with Heinen playing a prominent role and his 18 goals in 36 games leads the club (he’s third overall in scoring behind his linemates with 40 points). Even if the Pioneers don’t win the NCHC (they face stiff competition in the Frozen Faceoff to include No. 1-ranked North Dakota), they’re a lock for the NCAA tournament, which means he could be playing into April and won’t be available until late March or into the middle of April. 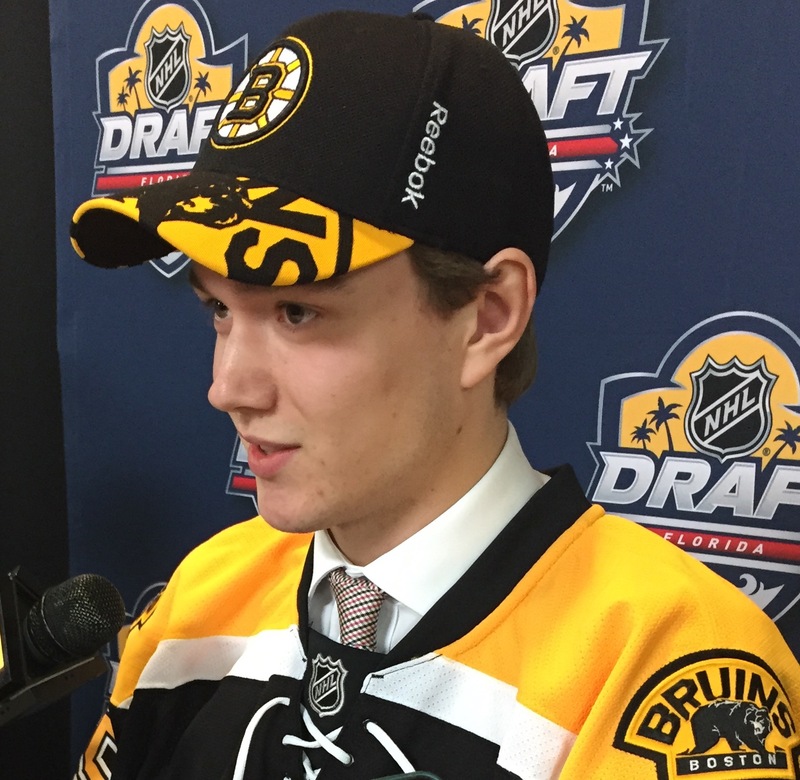 We’ll leave it to the Bruins to figure it out- timing is an issue for Heinen signing, but it’s a done deal that he will not stay another year in the NCAA, as he has reportedly told the Pioneers of his desire to move on. So, when the Bruins officially announce the signing (whenever that happens), you’ll know the decision was in the works for some time. Meanwhile, the B’s will have to see what happens out East as well, with a pair of senior defensemen in Grzelcyk and O’Gara who are wrapping up their collegiate careers. Grzelcyk’s BU Terriers were unceremoniously bounced by the upstart UMass-Lowell Riverhawks, who got some outstanding goaltending from Kevin Boyle (a UMass castoff, btw- I bet the Minutemen could have used him, eh?) but are expected to make the NCAA tournament card, so we’ll have to see how that plays out first. Also knocked out of the Hockey East tourney in surprising fashion- the Notre Dame Fighting Irish (and B’s prospect Anders Bjork) by Northeastern University, featuring B’s 2012 draft choice Matt Benning on defense. The 21-year-old junior and nephew of Vancouver Canucks GM (and former Boston AGM) Jim Benning is a defense-first guy who plays bigger and with an impressive physical edge for possessing pretty average size at 6-foot, 200+ pounds. He’s posted a career-best five goals this season after not finding the back of the net at all last year (his 24 assists/points still rate as his highest NCAA single season total to date). Benning isn’t going to wow you- he’s a consistent presence if nothing else. He’s not flashy or dynamic but is smart and rugged. He fills lanes quickly, gaps up well, and will pop you good if there are any thoughts of trying to cut to the middle- keep the head on a swivel when Benning is out there for the Huskies. His father, Brian, played more than 500 NHL games as a defenseman and tallied nearly 300 career points, so while his career wasn’t all that long (he retired at age 29), he was an impact two-way threat/effective puck-mover who was at his best in the late 1980s with the St. Louis Blues and Los Angeles Kings. Matt Benning is a chip off the old block- he’s got nice vision, the ability to make an effective first pass and a willingness to join the rush, not to mention the little bit of nasty he brings to bear during the trench battles along the walls and in front of the net. Everyone is excited to see how NU will do against Boston College (and Ryan Fitzgerald) this coming weekend’s semifinal match in their bid for Hockey East supremacy. As for O’Gara, he and his Yale second-seed mates were bounced out of the ECAC tourney over the weekend in two close, hard-fought games by the seventh-seed Dartmouth Big Green. Dartmouth’s goaltender stopped nearly 96% of the shots he faced in overtime and regulation wins Friday and Saturday. Yale played well enough to win those games, but the offense failed them at a critical juncture. O’Gara and Yale will find out their NCAA tournament fate (along with BU) on March 20 when the entire field of 16 teams (which includes the automatic-bid six conference champions) is announced. If neither BU nor Yale get a chance to see their seasons extended, then Boston’s hand could be forced sooner rather than later. Things are heating up…not just a sign of the coming spring but on the ice for the NCAA playoffs as well. Earlier, we took a look at the AHL/European pro prospects in attendance at Boston Bruins development camp this week, but the bulk of the recent draft picks from 2013, 2014 and 2015 are still playing in the major junior and NCAA ranks. This post covers the players who were in Wilmington, Mass. this week (those who did not attend due to injury or other commitment are not included) and is intended to scratch the surface of what each brings to the table for the organization. Enjoy! Lanky Minnesota high school product is about as raw as it gets at this stage, but could bring some long-term boom potential if he continues to progress. Felled by a bout with mononucleosis this season, he came back strong to finish the season at Mahtomedi High and then played a couple of USHL games at Sioux Falls. He lacks initial burst and agility in his skating, but crashes the net hard and scores goals the old fashioned way. Watch for this son of a former NY Islanders draft pick to make noise at Wisconsin eventually. Vancouver GM Jim Benning’s nephew didn’t find the back of the net last season, but was one of the Huskies’ top players for his all-around game and ability to move the puck effectively. For someone with pretty average size for a defender, Benning activates smartly on offense, takes care of his own end without fanfare and has a knack for making contact in the open ice. There isn’t a whole lot here to get excited about, but the NHL needs rugged, dependable blue liners of his ilk. If you are a believer that “less is more” with defensemen, Benning fits that category as someone who makes the right plays and uses his natural hockey sense to make it look easy. Smart, speedy two-way forward took some time last season to adjust to the NCAA with the Fighting Irish, but came on strong in the spring. Look for bigger numbers and contributions from this former U.S. NTDP star who may not have the silky hands to put up major points, but uses his speed to back defenses up and has the vision/hockey IQ to make plays offensively. He didn’t make a lot of noise at camp this summer, but for a player of Bjork’s style, that’s not necessarily a bad thing. Enormous rearguard has an even bigger reach; this value selection (acquired with one of the picks in the Johnny Boychuk trade) brings fine mobility and agility for such a big kid. Concerns about his offensive game may have dropped him down to 37, but he skates with his head up and can advance the puck effectively enough even if the production doesn’t develop as hoped. Where Carlo’s real value lies is in his size and quickness as a player who will be very difficult for opponents to get around and make them pay for every inch of real estate with a physical, hard-nosed style. Don’t expect him to win a job with the Bruins this season, as the team will likely want him to keep playing prime minutes in the WHL under all situations. Carlo appears to be the latest example of “shiny new toy” syndrome- that phenomenon where fans glom onto a name and seem to obsess over him making the NHL right away- but if he does happen to join the Bruins out of the gate, it will take a phenomenal training camp and preseason, and not what he did at Ristuccia in July. The son of former NHL enforcer Louie DeBrusk finished 6th in the WHL with 42 goals playing alongside fellow Bronco and B’s prospect Colby Cave (35 goals) last season. Much bigger things are expected of this natural finisher, who can find the back of the net from just about anywhere on the ice. DeBrusk is not a power forward, but more of a skill forward who uses his offensive instincts and quickness to make things happen around the net but is far from a finished product in terms of his complete game. He has quite a bit of physical maturing to do, but the natural scoring tools are there for him to evolve into a top prospect. The most dominant scorer in prep hockey a season ago took a step back offensively at Dexter School as a senior, but sacrificed numbers in leading his team to the championship game before falling to Salisbury. Ted Donato’s eldest of three sons finished the year with a flourish in Omaha of the USHL, registering more than a point per game and showing off his creativity and dynamic game-breaking ability on numerous occasions. Although his top speed is not like his dad’s, the younger Donato projects to be a more dangerous scorer, and will get a chance to prove it with the Crimson. The rising junior has two productive scoring years with the Eagles in the books, and will be even more dangerous offensively this season. Although not blessed with a lot of size or blazing speed, the nephew of Bruins assistant scouting director Scott Fitzgerald has elite vision and some of the softest hands of any Boston prospect. Because he slipped down to the end of the fourth round in his draft year, the two-time state champion with Malden Catholic doesn’t get as much attention as other players with higher draft pedigrees, nor is a development camp a great setting to display what Fitzgerald does best, but his smarts and energy will carry him far. 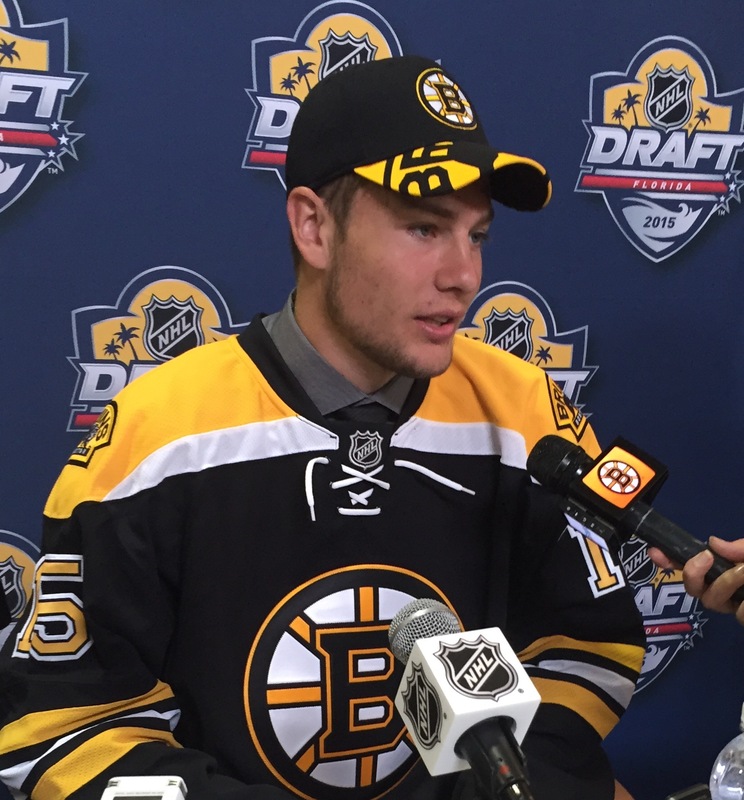 “JFK” wasted little time in telling media at the draft that the NHL player he most tries to emulate is Patrice Bergeron. Like Boston’s three-time Selke Trophy winner and franchise center, this Swedish import plays a polished defensive game in addition to a pretty underrated offensive skill set. He’s got quite a bit of physical developing ahead of him with the Terriers, but film study reveals a player with slick hands and a knack for making plays in key situations. A superb faceoff man, watch for Karlsson to earn David Quinn’s trust early on with key defensive zone draws. He’s been knocked for not playing with as much pace and urgency as his talent level will allow, but seems to be making strides in addressing that shortcoming as he goes forward. A recent discussion with a member of the Bruins organization kept going back to JFK’s natural smarts and intelligence- he certainly showed that at camp and should draw positive attention to himself on Comm. Ave. this year. Built like a spark plug and with the fiery, agitating demeanor to match, this draft choice could one day turn out in similar fashion to the one NHL player Gabrielle tries to pattern his play after: Brad Marchand. He may not have Marchand’s high-end speed and stickhandling ability, but can blow the puck past goalies and has a high motor. He’s a little bigger and stronger than Marchand, and able to be more effective along the walls and down in the dirty areas, where he uses his strength to fight through checks and maintain possession. The Saskatchewan native who grew up rooting for the B’s needs to prove he can work as hard off the ice as he does on it, but was a solid value choice at 105th overall. Perhaps one of the 2014’s draft’s true stealth picks, the former Surrey Eagles (BCHL) captain burst onto the scene for the Pioneers last year to finish 15th in the nation in scoring as a freshman. Bigger things are expected this time, which could be a challenge for the slick, heady playmaking wing who shows an excellent grasp of how to play with and without the puck. Appearing in just his first development camp (he was enrolled in classes at DU a year ago), Heinen showed the fans in attendance what the buzz building from last year was about with a standout performance, making high-end passes and plays look pretty routine. If there is one player in the current Boston draft class that could pull off a surprise like Heinen did a year ago, it is Hughes, who was an offensive star for the AJHL’s Spruce Grove Saints in 2013-14 before landing with the Badgers and being relegated to a smaller role in Madison. A speedy, intelligent forward who also plays with energy and grit despite not having an abundance of size, he’s the model type of player the Bruins talk about having. If the unproductive freshman season was a reflection of a lack of opportunity, then watch for Hughes to breakout offensively as a sophomore and earn a lot more positive attention. He’s relatively undersized at present, but has room to grow and add strength in the coming years. The RedHawks’ captain this season was acquired along with a first-round pick in the trade that sent goaltender Martin Jones to the Sharks late last month. While not a high-end prospect the Ohio native is big, skates well, and plays a strong two-way, grinding game. He scored 19 goals a year ago, so he might be primed for a bigger offensive jump this season. Realistically, Kuraly projects more as a third-line winger in Boston if he reaches the NHL, but has the makings of a solid forward who will be tough to play against and can move around up front as the coaches need him to. This Red Line Report favorite for his combination of size, skating, shot and smarts didn’t get a lot of advance billing throughout the season, but started to generate buzz before the June NHL draft. In addition to being the QMJHL’s top goal-scorer among draft eligible defenders, Lauzon also displayed a physical, edgy side to his game as well, making him the kind of ideal fit in Boston if he can translate his junior success at the pro level. The 52nd overall selection will likely spend two more years in the ‘Q’ but don’t be surprised if he makes a run for an NHL job shortly thereafter, as he appears to have the blend of skill and moxie that every team looks out for. Like Zane McIntyre, the Long Island native is one of Boston’s longest-tenured prospects, having been chosen four drafts and five B’s development camps ago. The tall, relatively lean defenseman still has more room to add mass and will likely hit his peak playing weight at about 225 pounds as he continues to mature. At 22, O’Gara is an advanced player who has superb skating and footwork and has also continued to develop as a fine puck-mover even if he isn’t projected to put up big numbers at the pro level. A smart player and tireless worker, he’s returning to Yale for his senior season and is expected to sign with Boston after his final game. Also like McIntyre, O’Gara would qualify for the free agency loophole, but has had such a good experience with the Bruins, he’ll likely stay true to the club that has believed in him all along. The 2015 NHL draft’s first true off-the-board pick has the natural skills to eventually justify the selection, even if the Bruins took an acknowledged risk with other more established players on the board. The good news: the Ottawa-area product is a fine skater who can beat defenders wide with his speed, takes pucks to the net and has the hands to find the back of the net with regularity. On the downside- scouts question his natural creativity and there is significant risk associated with him if he does not take the next anticipated step in the OHL with the departure of several key veterans he was playing behind. Although he isn’t an intimidating presence on the ice, Senyshyn is saying and doing all the right things and demonstrated his raw, but promising talent at development camp. This massive netminder from the same Czech program that produced Jaromir Jagr 25 years ago has major long-term potential, but will need to address holes in his game and refine his technique before he sets foot anywhere near NHL ice. An outstanding athlete, “Darth Vladar” has the natural quickness to make beating him on the first shot a chore, but gets into trouble when he doesn’t square up to the shooter or allows pucks to get through him/his equipment when in position to make the save. A good kid with a solid work ethic, coming to the USHL and possibly going the NCAA route will help him adapt to North American hockey, but some observers feel that he lacks a natural feel for the play, and falls prey to allowing goals because he is late reacting to where the puck is coming from. Vladar is a good flyer to take in the mid-third round, especially after the B’s watched what Mike Hutchinson, their third-rounder in 2008, did for the Winnipeg Jets this season. Boston’s top pick last month, 13th overall, has already signed a three-year Entry Level Contract (ELC) with the team, but that won’t affect his timeline to the NHL unless something unforeseen occurs. On the positive side, Zboril has all of the key attributes you look for in the modern big league defender, and his skating and vision in particular makes him someone who will be able to carry the puck and run the power play down the road. Reviews on his work ethic however, are mixed, and he had issues with his knees last season, something he unfortunately has in common with his father, who reportedly saw a promising athletic career cut short because of. Make no mistake- Zboril’s booming point drive and ability to distribute the puck with ease, not to mention a snarly, physical side to the way he defends made him a solid choice for the Bruins, but like the other two first-round selections, he carries some risk that will bear close watching as we go forward. Here are some notes on a few of the development camp invited players I’m familiar with/who stood out in live and online viewing during the past several seasons and at development camp. Al Iafrate’s son got a lot of attention for his family pedigree and like his dad, he can scoot-n-shoot. However, Max is not his father, and after going undrafted while playing in the OHL with the Kitchener Rangers, he signed an AHL contract with the P-Bruins. With his size and physicality, the younger Iafrate is an intriguing player to watch if he can make better decisions and keep things simple. Putting him out with someone like Tommy Cross could make for a mighty interesting duo. The rising Yale junior has been a favorite of mine since the 2012-13 season, when the Ronkonkoma, N.Y. native helped lead the USHL’s Dubque Fighting Saints (he was on the team with Matt Benning) to the Clark Cup. Although he went undrafted, DiChiara is a big-bodied winger who uses his size and soft hands to find the back of the net and generate offense. He’s not an ideal skater, but if he can improve his initial quickness, his straight-line speed and natural strength will appeal to NHL clubs come free agency time because he has a nose for the net. In addition to Benning, DiChiara is a current and former (in minor hockey) teammate of Rob O’Gara and the two are close friends. Honestly thought this ’95 defender who posted a solid freshman season with the Terriers would get drafted last month. What you see is what you get with Diffley: he skates and moves laterally well, has an active stick to disrupt passes with, fills lanes and willingly blocks shots- in other words, he does all the little things you need your back end to do. There is not much in the way of upside, but if you’re looking for a safe, steady defenseman, there aren’t many undrafted options out there better than Diffley is. After winning a state championship at MC with Fitzgerald, this smallish but talented and creative winger spent two years in the USHL before winning an NCAA title with Union College in 2014. Speed is the name of the game with Vecchione, who has explosive initial quickness and has an impressive glide. He’s also a savvy two-way forward who shows hustle and diligence on the back check and with his defensive responsibilities. With 33 goals in his first two college seasons, he is primed for a major breakthrough this year and big bucks as a free agent.